Hotels in Bhutan use the traditional Bhutanese architecture, with of course modern feel and facilities attached to them. These hotels in Bhutan are not allowed a star categorization like in other parts of the world. All hotels and resorts are approved by the tourism council of Bhutan, and have to follow the prescribe standards set by the authority. The standards are high and stringent. The categories that are given to the hotels are only for easy understanding of the hotels by the tourists. The hotels fall under the category of luxury, deluxe or standard. 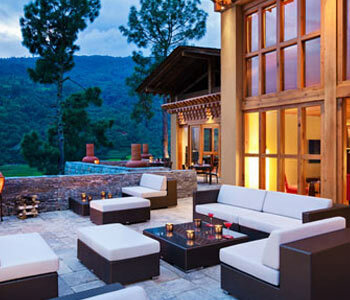 Big international hotel chains like Aman, Taj and Como do have a presence in the major towns and countryside of Bhutan. These hotel chains have their hotel properties set up at prime location in Bhutan. Comforts and luxury offered by these hotels are perfectly blended with Bhutanese art, culture and tradition. Enjoy Bhutanese food and local delicacies while your stay at a hotel in Bhutan. Our accommodation section features a range of hotels in Bhutan which are classified into luxury, deluxe and standard category.